Trifle is a layered dessert and you can make them easily with a layer of cake,followed by fruits and custard. But today's version is completely different one from the usual one, actually when my younger one asked me for a trifle i quickly whipped out this simple trifle with some chocolate cookies, chopped strawberries and whipped cream, trust me even i was surprised when i had this trifle as dessert after my lunch. 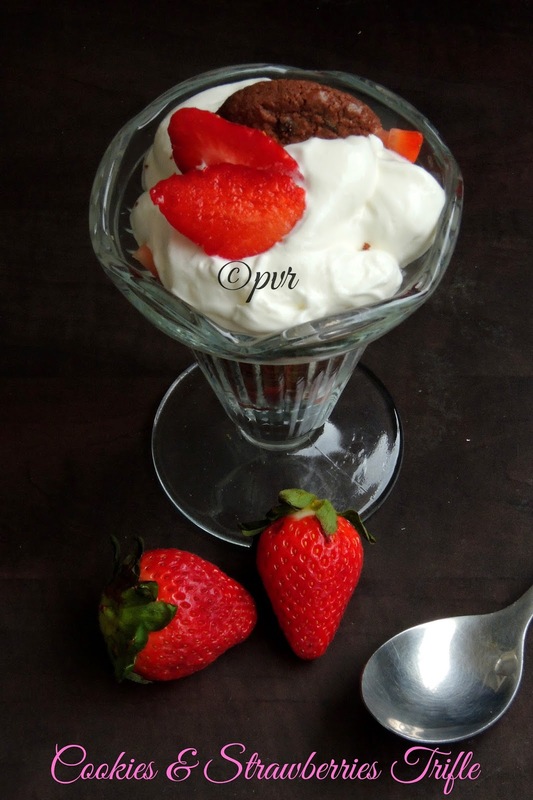 A quick, simple and definitely an easy breezy dessert you can just prepare within few seconds if you have whipped cream at home, else just simply go for a custard sauce.I used strawberries, if you dont get or else if its not strawberry season just go with your favourite fruit. I seriously want to clear few of my drafts since a long, finally today i got a chance to post one among those drafted posts. 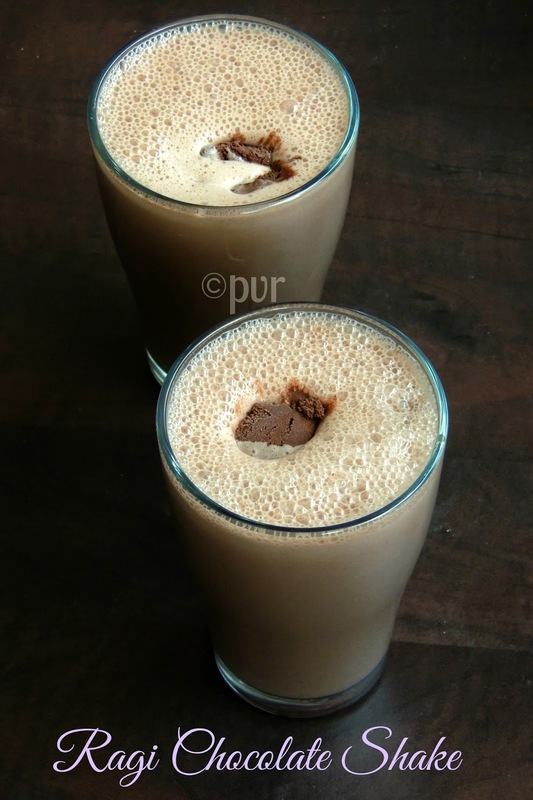 This ragi chocolate shake goes for an excellent and easy breezy preparation, actually i prepared this shake from one of my favourite blog to celebrate that blog's anniversary. Trust me, none will notice the addition of ragi here as chocolate syrup and chocolate ice cream will mask completely the addition of cooked ragi porridge very well. Obviously this shake is one of the excellent and very best way to sneak as ragi porridge is the most hated whole grain porridge by the kids.I tried many versions of porridge to feed my kids especially with ragi or finger millet, everytime either they will have just two or three tablespoons or else i have to beg them to finish their bowl of porridge. But when i served this shake, my younger one just finished his whole glass within few seconds. Obviously i was shocked and surprised when i saw his glas was completely empty. Am a person who love to dish out easy breezy dishes whenever am in hurry or lazy to cook. If you go through my space, you can definitely see varieties of one pot meals and many more easy dishes which gets ready in less than 15-20minutes. Actually i love to spend most my leisure time in my kitchen but i dont take too much of my time to cook, sometimes i make cook three or four dishes simultaneously as i dont have much time to spend in my kitchen or in cooking during my week days. For the past 5months, am cooking like a mad during weekends as i want to prepare few dishes just to keep my space alive before the weekend gets finished. Obviously i go for quick and easy one pot meals for our lunch. 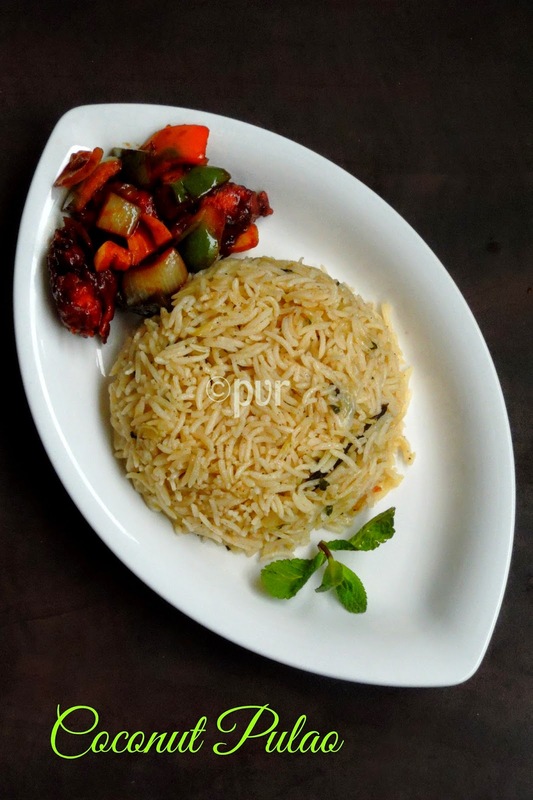 One among those quick one pot meal is this coconut pulao or white pulao. This dish is my young one's favourite, trust me this dish is very quick to make and gets ready easily in pressure cooker. 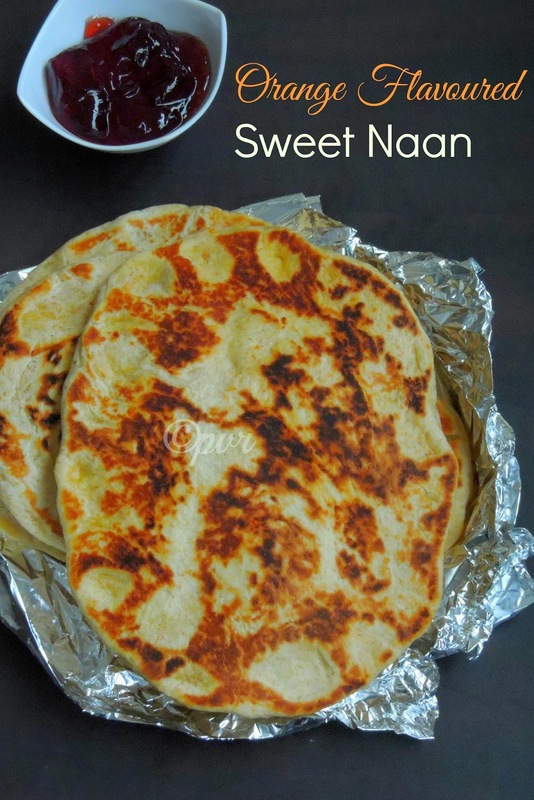 You might have heard about the famous Kashmiri naan stuffed with dry fruits but my today's recipe goes for orange flavoured sweet naan. I dished out this orange flavoured sweet naan as i got orange and butter as my secret ingredients for this month's Shhhh Cooking Secretly Challenge an interesting event started by me and my partner of this month is Shailaja of Sahasra Recipes. Every month i combine a pair with the members of the group, later they exchange two secret ingredients between them and they will come up with their dishes prepared either with one or else with both their secret ingredients. We are having fun in guessing other's secret ingredients through the pictures each of us have been sharing in our FB group. Making a delicious dish out of the secret ingredients is definitely a challenging task and am very happy to say that the members of this group just rocks. I dont want to repeat again that am a chocoholic person, obviously you can see lovely array of chocolate based bakes and desserts in my space, but still some desserts are yet to cook and to post here. However cooking and baking are my favourite passion and i can spend a day in my kitchen either by baking and by cooking without any hesitation. As i told earlier, i can die for a piece of chocolate and i dont regret saying this.Its been ages i baked chocolate tarts and this time i gathered all the ingredients to make some eggless chocolate tarts with an eggless and easy breezy chocolate mousse with whipping cream also i opted for chocolate buttery crust for my chocolate tart, yes my tart is completely prepared with chocolates and chocolates. After a vegan Wacky cake, my culinary experience with this week's theme of blogging marathon goes again with a ooey gooey baked chocolate pudding.Since am running my third week of blogging marathon with desserts as theme i have been posting super delicious desserts from the link given by Srivalli where i picked three different desserts under three different categories. Yes this week's blogging marathon's posts are loaded with chocolates,but wat to do if you ask me to pick a dessert i'll definitely go with the chocolatey ones. 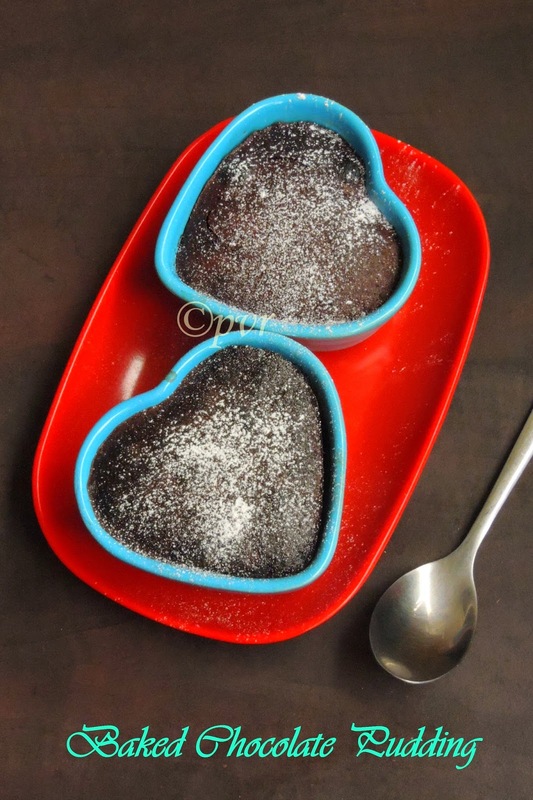 I just get struck with chocolate based desserts, and am very much proud to say am a chocoholic person.Coming to today's dessert, its a baked version of chocolate pudding, chocolate pudding can be prepared either by baking or simply without baking either with gelatin or agar agar.I opted for the baked ones and this pudding came out just simply out of the world. 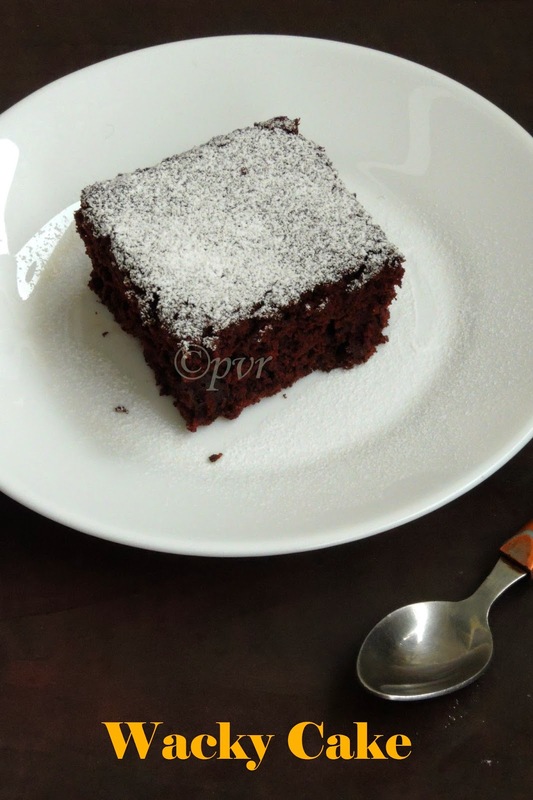 Wacky cake is a cocoa based cake without milk or eggs and a super spongy cake. 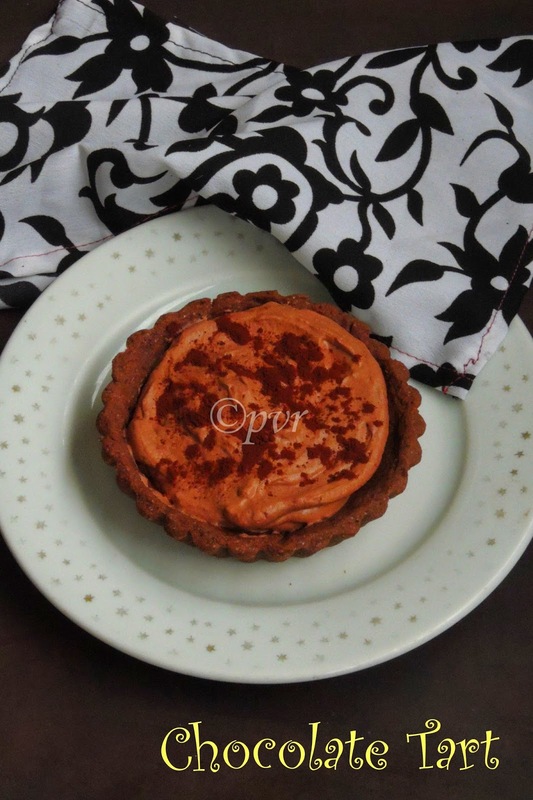 This cake is simple to prepare and unlike most of desserts or pastries this cake goes for an easy preparation. You doesnt need any other special gadgets etc. As per wiki,it is commonly believed Wacky Cake may have been created as the result of rationing during World War II, when milk and eggs were scarce. Active ingredients in wacky cake include flour, sugar, cocoa powder, baking soda, vegetable oil, white vinegar and vanilla extract. Some recipes add brewed coffee as an additional ingredient. The cake may be topped with icing or confectioner's sugar, or even served plain.The cake is considered a popular delicacy at bake sales in numerous rural regions of the United States. I have planned so many bakes specially for valentine's day but as usual i couldnt bake anything for this V day. However i planned to bake an interesting yeasted buns or breads for this special occasion. 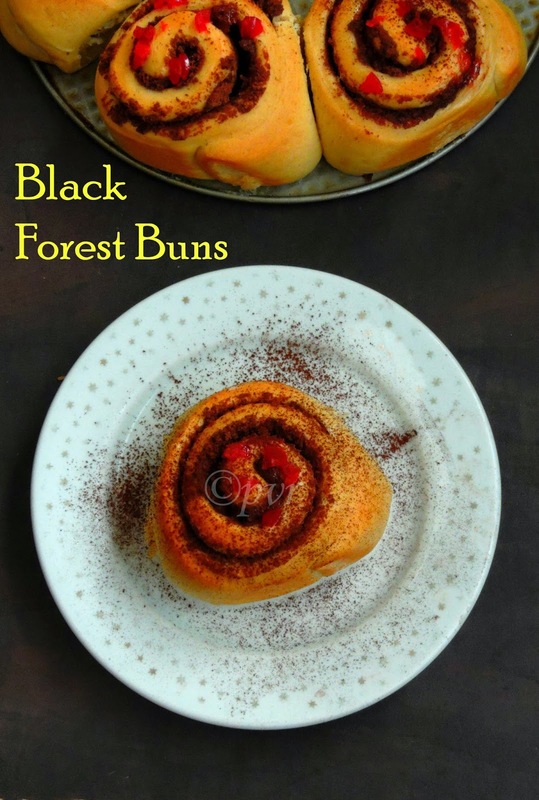 I couldnt stop myself to bake this fantastic black forest buns as they suits absolutely prefect for this celebration.This black forest buns are this month's challenge of We Knead to Bake, monthly event by Aparna, My Diverse Kitchen. Black forest buns sounds as much as like the famous Black forest cake which goes for chocolate cake, cherry compote, kirsch and loads of cream, while this buns goes for chocolate cake,cherry compote or strawberry jam.Actually its better to use cherry compote but unfortunately i went for strawberry jam as none at home like cherries in buns. When i picked raw banana as my star ingredient for this blogging marathon under the theme one vegetable in different forms, i was very much sure to give a try to a paratha with cooked and spiced raw bananas. Finally i tried them and my trial turned out absolutely prefect. Cooked raw banana puree added to the wheat flour and spiced with garam masala makes this absolutely soft,flavourful and mildly spicy raw banana paratha. 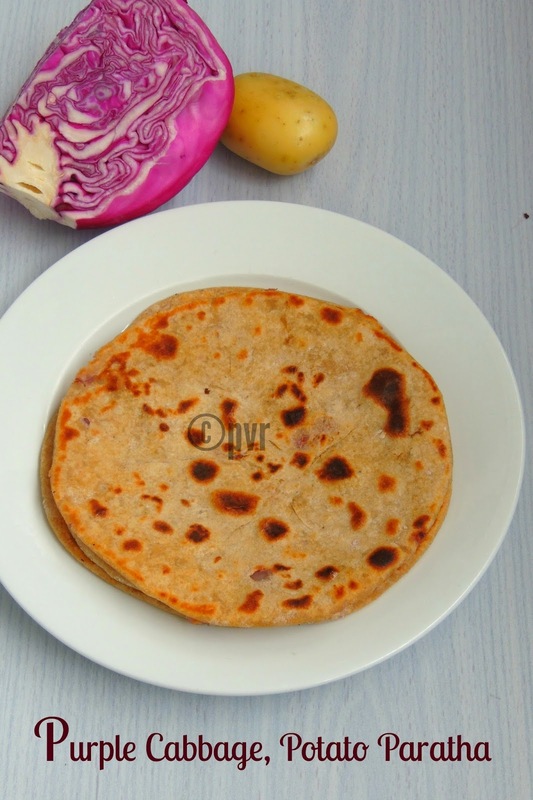 Colour of this paratha was bit dull when compared to the usual ones but tastewise they came out simply prefect and super soft, the addition of cooked raw banana puree gives the softness to this paratha. If you want to make a different paratha from the routine one, then give a try to this raw banana paratha. After an authentic Andhra style side dish, am taking you all to God's own country, yes my today's post have its important place in Kerala Onam Sadya. Kurukku kaalan is a yogurt based tangy gravy prepared simply either with elephant yam or raw banana or else both. This dish is served along with varieties of dishes during Onam festival and this gravy makes an excellent dish to enjoy thoroughly with white rice. Kurukku kaalan gets ready very easily and the grounded paste used in this gravy plays an important role. A thick grounded coconut, cumin seeds and green chillies makes the difference between this dish from other yogurt based gravies prepared in many regions of India.For my today's post instead of making this dish with yam and raw banana, i simply went with raw bananas. 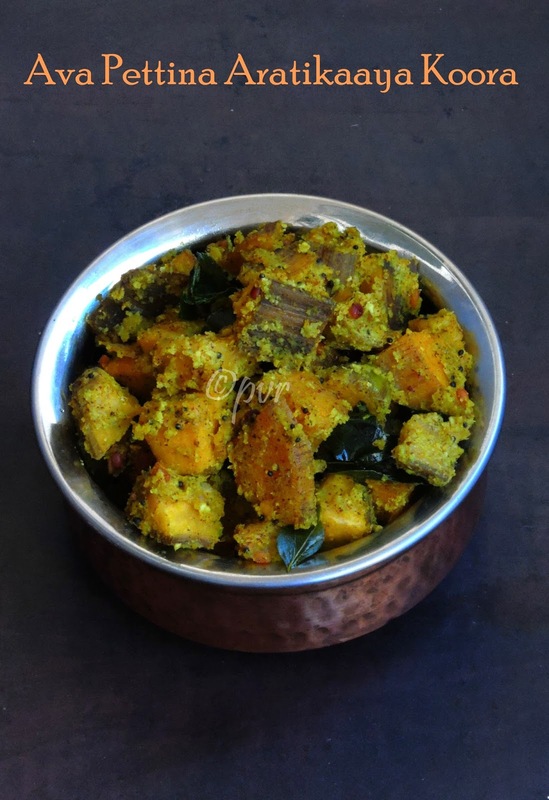 Andhra style side dishes are my favourite, whenever i feel like having something spicy and different from my usual Tamilian side dishes,i will immediately take a look at my cook book collections. 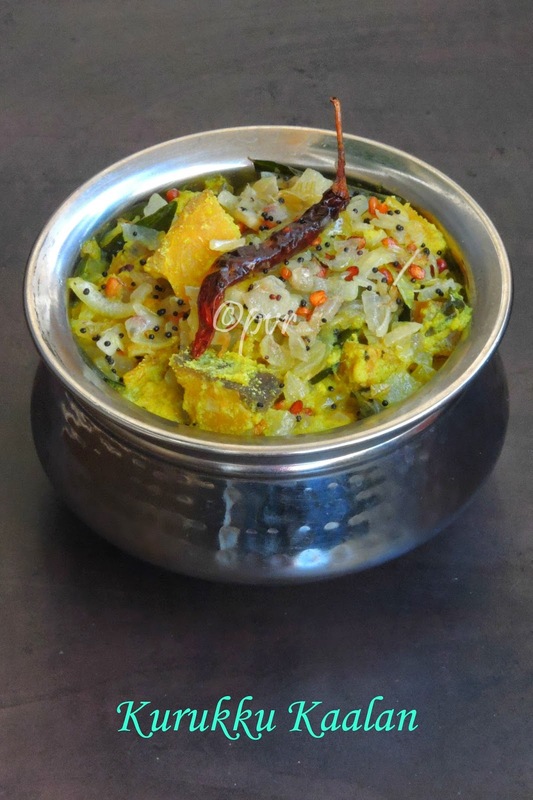 I cherish two cookbooks i won through this wonderful virtual world, one among those books is Cooking at home with Pedatha.This book is definitely a treasure if you are searching for authentic Andhra style dishes. While going through this book i got hooked immediately to this mustard flavoured raw banana curry. This curry is definitely an easy breezy dish, goes awesome as side dish with any sort of rice dishes especially with curd or rasam rice. purple cabbage along with potatoes to make some delicious paratha. Actually i rarely get purple cabbage from the nearby farmer's market , dunno why i rarely cook with apart from making coleslaw as this purple cabbage make the raw cabbage salad more colourful.My experiment with purple cabbage and potato paratha turned out extremely prefect, and the stuffing colour pulled everyone to think twice and somehow everyone at home thought that the stuffing was made with beets. However i revealed the secret ingredient while serving. Paneer, this Indian cheese is our family favourite, my fridge will always have this cheese. If i dont go to Indian groceries, i'll make myself paneer at home. However paneer have an important place in our diet. If i have paneer in my fridge, i can just dish out anything with it within few minutes to satisfy everyone's tastebuds at home. When i picked Indian bread basket as this week's blogging marathon's theme, Srivalli mentionned that even Dosa are known as Indian breads, obviously i couldnt resist myself to make this nutritious ragi masala dosa. This time instead of making a simple masala dosa i opted for a lipsmacking paneer masala for the stuffing. 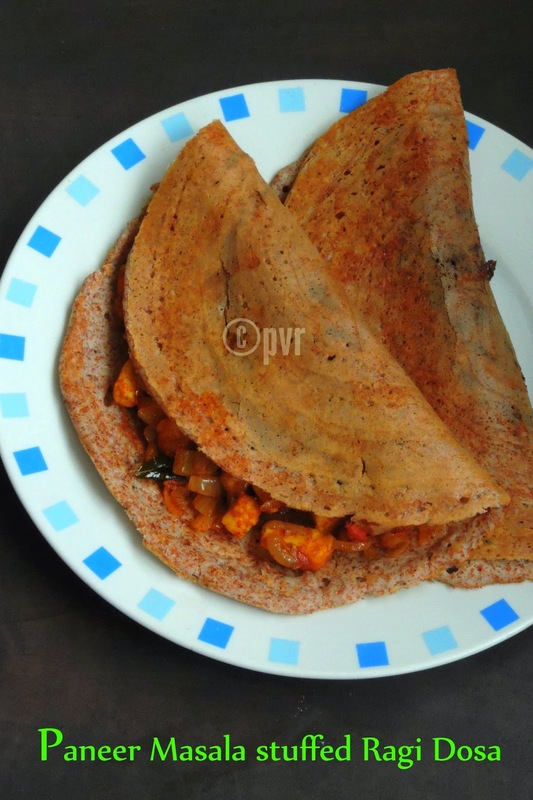 Trust me, this ragi masala dosa turned out extremely delicious and everyone at home enjoyed thoroughly this calcium packed protein rich masala dosa. Love stuffed paratha especially with potatoes, however i do often stuffed parathas with any stuffing. 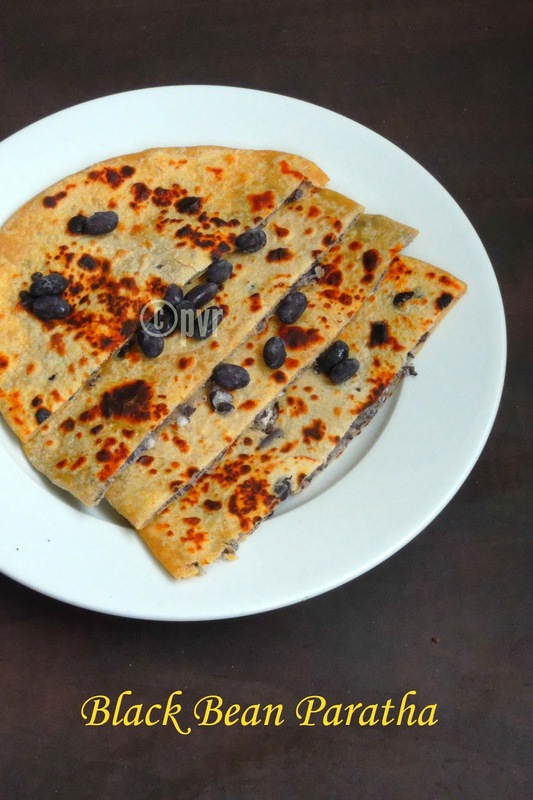 I always want to give a try black beans stuffed paratha. I get black beans rarely eventhough i dont have any valuable reason for it but still whenever i go to Indian groceries i'll get varieties of dry beans. Having dry beans at home is definitely very handy, i always soak huge quantites of dry beans and arrange them in freezer for further use, and its quite a routine for me. 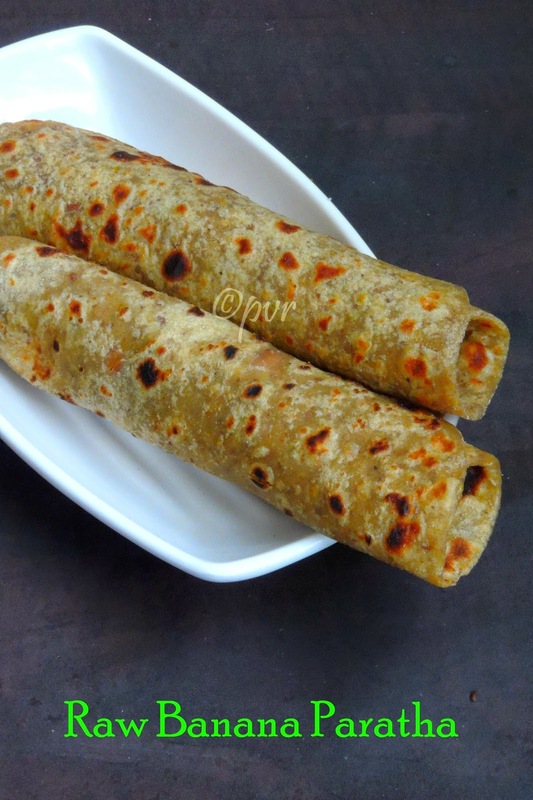 Obviously i'll always have soaked ready to cook frozen beans in my freezer.Finally am done with spiced black beans stuffed paratha few days back for our dinner.Trust me, this fabulous stuffed paratha makes an excellent filling meal as well.